Those who own stocks and housing now will continue getting richer, those who don’t will be priced out of these markets. A classified Federal Reserve memo sheds new light on the Fed’s confidence in its control of the economy and the stock and housing markets. 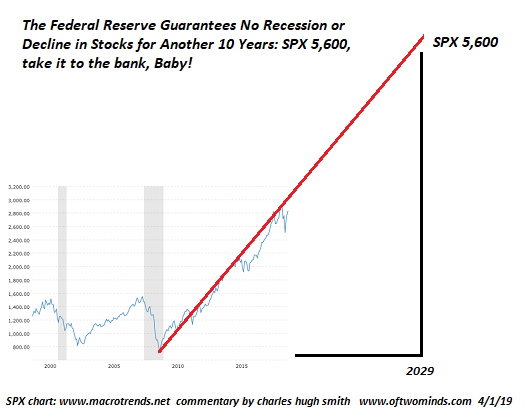 In effect, the Fed is guaranteeing that there will be no recession for another 10 years, and that stocks and housing will remain in a permanent uptrend. Paraphrasing the memo, we have the tools to insure that stocks and housing do not just remain at a permanently high plateau but continue to move higher in a permanent uptrend. I’ve marked up a chart of the S&P 500 and the Case-Shiller Housing Index to illustrate the Fed guarantee. 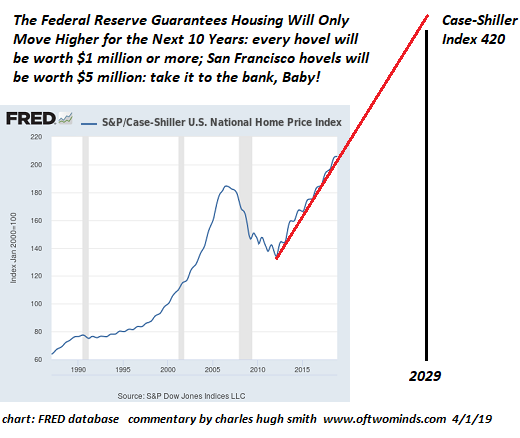 As you can see, stocks and housing will at a minimum double in the 2019-2029 period, and could do much better. The Fed memo refers to the enormous success of the Fed’s dovish about-face since December: (again, paraphrasing the memo): The Federal Reserve’s management of policies and market expectations since December prove that we can reverse any downturn and reignite expansion of stock and housing valuations at will. We can thus guarantee a permanent expansion of stock and housing valuations into the indefinite future. The memo also notes that there are many policy extremes such as negative interest rate policy (NIRP) that the Fed holds in reserve. In other words, the toolbox is full of shiny new tools the Fed hasn’t even used yet. This is one reason for the memo’s supreme confidence: there is no slowdown or downturn that the Fed can’t reverse within a few weeks via policy tweaks and perception management via public pronouncements and PR campaigns. There is one fly in the ointment the memo mentions: the Fed is powerless to push wages and earned income higher along with stocks and housing. 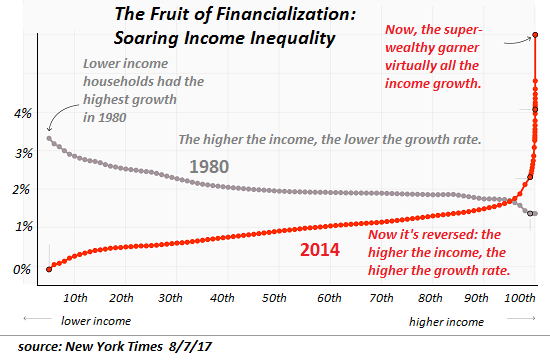 So while stocks and housing soar to the moon, wages will continue stagnating or losing ground as rising prices for healthcare, rent, childcare, college tuition, etc., continue chipping away at the purchasing power of earned income. Until a political and social Cultural Revolution sweeps away the Fed and the rest of the parasitic ruling elites. This is an April Fool’s Day whimsy. But how far it is from what the Fed elites actually believe is unknown. Thank you, Mike M. ($50), for your marvelously generous contribution to this site — I am greatly honored by your support and readership. Thank you, Mike G. ($100), for your outrageously generous contribution to this site — I am greatly honored by your steadfast support and readership.